In Catalonia, there is this part of the year when going out to peel calçots for lunch at any of the many masias spread around the country becomes almost a matter of state. Most well-known places for calçotades are in the southern province of Tarragona, in a region called Valls but around Barcelona it is not strange to find a good spot in an idyllic environment. The place I will mention today is just an example and of course you are free to choose. It is called Masia Can Palau and it is located in Vilanova del Valles some kilometers away from the city of Barcelona. The 30 eur menu included Calçots with Romescu sauce, grilled meat (a mixture of chicken, sausage, lamb and rabbit with fries) and dessert. 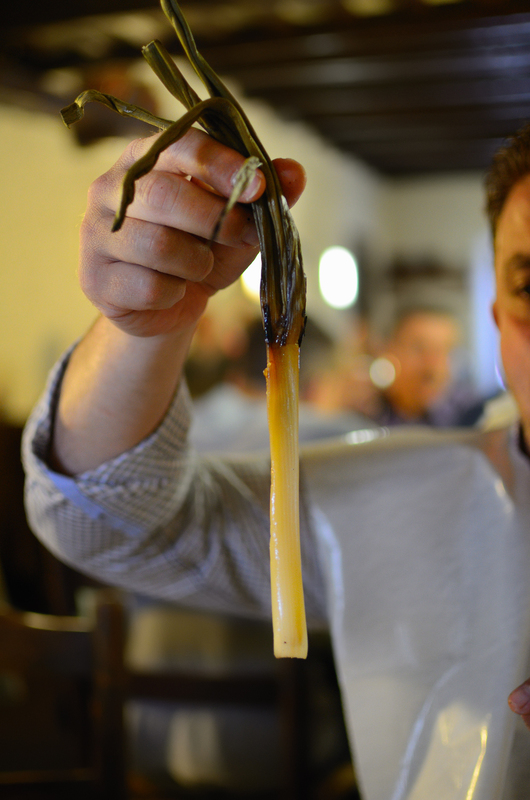 We had two generous rounds of calçots per person. They came wrapped in aluminum foil and were very hot. But how do you peel Catalan calçots? You have to grab the calçot by the leaves and with the other hand, press gently on the black roasted skin of the bulb and peel it off. Beware you don't press to hard and pull away the inner part of the calçot. It requires some practice. It should come out clean. After that you soak the tender and juicy stems of the plant in an exquisite romesco sauce which is made with almond, garlic, red pepper, hazelnut, tomato, olive oil, vinegar, crumbs of fried bread, salt and pepper. If you want to know how they cook calçots and what they are, check my previous posts: Catalan Traditions - Calçotada: A Close Look and Grilled Leaks...Check the sauce in next post.